Yesterday Justin and I spent all day in the classroom. The teacher shared a story with us about her almost eight year old daughter and trying to explain the test you take in order to receive your driver’s license. The little girl was intrigued and then wanted to know what type of test her Mom’s students have to take at the end of her class. Well, her Mom teaches prenatal parenting classes, and crazy enough, there is no test at the end. 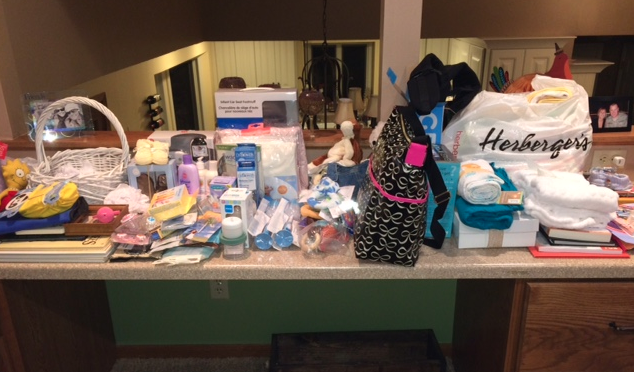 We attended an express, all-in-one day, preparing for childbirth class. 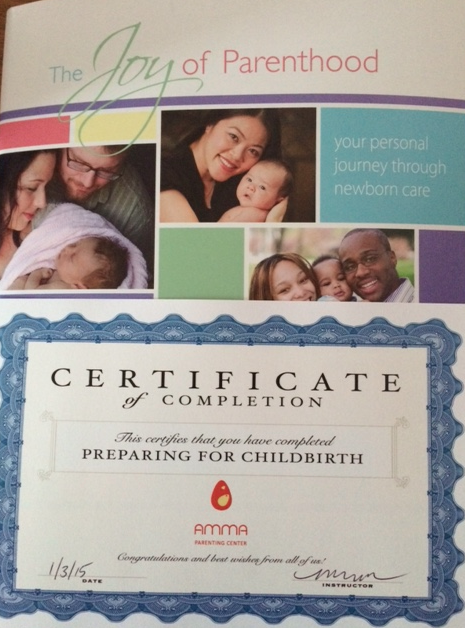 We took the class through Amma Parenting and had a great registered nurse, Meggin, as our instructor. Amma was recommended by our provider and they also contract with the hospital we plan to deliver at. After looking at their course offerings and realizing we really don’t have a lot of time to dedicate to more classes since I am still in grad school and Justin is wrapping up his thesis we decided to do the all-in-one. The all-in-one is more high level, touches on a lot of things, but doesn’t go into great detail about everything. I found this to be just fine for what we were looking for, and Justin was happy with it as well. The first half focused on labor and delivery and the second half was about nursing and newborn care. The only thing I question now is whether or not we should look into a labor and delivery class that teaches more coping mechanisms since after watching the labor and deliver video I was like, “Hells no.” And if I am being honest, the video wasn’t even that bad and was only 12 minutes long so I probably need to buck up here pretty quick. I thought our instructor did a great job keeping things light and exciting as I am sure most couples looked confused and terrified at different times during the class. She also did not push any opinions or objectives on us. She did share personal stories from her births when asked and what she has seen as a long time labor and delivery nurse but always stressed that there is a pattern to labor but not one is the same. I know Justin said he is feeling a lot more confident especially now that he has some ideas of what he can do to support me through labor and learned more about new-born care. I am not so sure my confidence is any higher yet but I am more informed about what we have gotten ourselves into. Haha. Just kidding. Sort of. Proof that we are certified to parent! I also thought I’d take this opportunity to briefly share some other resources we have taken advantage of throughout the pregnancy as well. Justin and I have attended two paid Bump Club events together and I have attended one free one by myself. The paid ones can be expensive depending on what type of tickets you buy. For instance, the first one we attended, Gearapalooza, cost $130 total for us both to attend. Our ticket included a Beco Carrier retailing about $130 and a swag bag worth $150. I also won a Baby K’Tan which retails about $50. The second one we attended was for expectant parents that was a dinner and presentation all about sleep! Such an important topic. We paid about $160 total for us both to attend. Our tickets included a Motorola Video Monitor retailing about $200, another swag bag, and I ended up winning a Skip Hop Duo Baby Bag retailing about $60. The information was awesome as well! The free ones are about an hour-long, held at a Target in Minnetonka and also offer great information. I went to a car seat basics one and learned more about car seat safety…which is always important since I think about 80% of people are using them incorrectly! I didn’t win anything but they do offer 10% off in baby for that night so it is well worth the trip for the education and the discount. This is almost all Bump Club swag. Everything that is included in the gift bags is legit, useful stuff too. It isn’t just a bag full of samples and brochures. Totally worth it in my opinion! 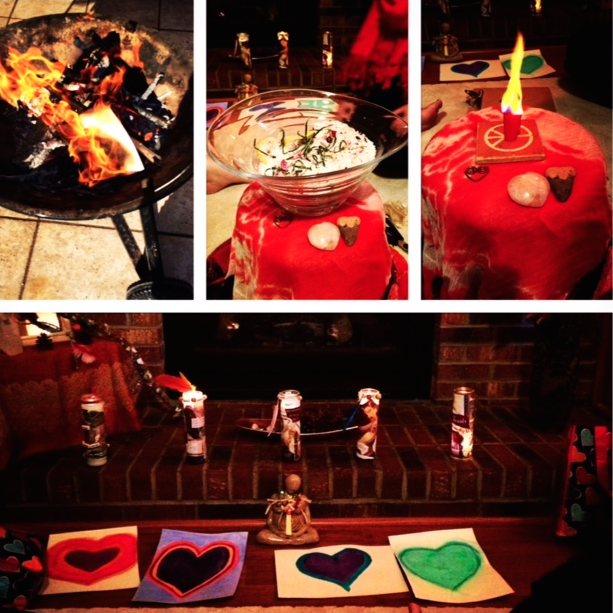 I also attended a Sacred Pregnancy Retreat in November hosted by Moon River Wellness. I didn’t learn about how to care for a baby or survive childbirth, but it was an awesome opportunity to connect with myself & baby, as well as other pregnant mamas. It was a day retreat with three other woman, and we did multiple activities and rituals to help us connect and understand that being pregnant can and should be a sacred journey. I really enjoyed it and left feeling a little less anxious about the process. I still think about it today now that I am in my final trimester, and when fear starts to creep in I light the candle we made and spray the essential oils we mixed and just reconnect with myself. I would highly recommend you look into this if/when you are pregnant…and it is not just for first time Moms! I’d love to hear if you found any resources particularly helpful during your pregnancy. Comment below! I had never heard of Bump Club and Beyond – Twin Cities. It sounds interesting. Did you think the class was worth the money? Wife, mom, MN native, and lake lover. the story of a life lived thoughtfully.